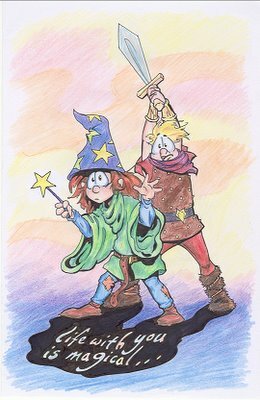 Advanced Dungeons and Parenting: Ten Years! Ten Years Man! Happy Anniversary Jody! Ten Years! Ten Years Man! Happy Anniversary Jody! Ten years ago today Jody Lindke and I were married in a lovely ceremony which was followed by an equally lovely, but totally breakneck, honeymoon. Since we were friends for a couple of years before we actually started "dating," it has been a swift decade filled with adventure. Okay, okay, I'll tell you. Those who read last year's entry can skip below the blockquote if they have a very good memory. The ten year anniversary is, traditionally, the "tin or aluminum" anniversary so Jody and I got each other gifts with some tin or aluminum. I got her mugs, a framed ceramic tile, and an aluminum sign featuring the artwork she drew for our card last year. She got me a framed (in aluminum) Twister poster. It is the most romantic thing I have ever received. If you are wondering why, it might illuminate things if I mention that we watched Twister almost everyday during our honeymoon. Looking at the poster was like reliving the entire honeymoon. Tonight, as we do every anniversary, we will watch the Bill Paxton vehicle while cuddling on the couch. Our kids, when we have them, will wonder what our attraction to the film is, but we will be mentally back in Seattle on our honeymoon.